First, and probably the most intuitive step, (though for the avid runner, probably the hardest part of the whole healing process) it is time to take a little rest from your preferred activity that seems to aggravating the pain. I generally recommend a rest period of 4-8 weeks depending on the severity of the tendon issue. 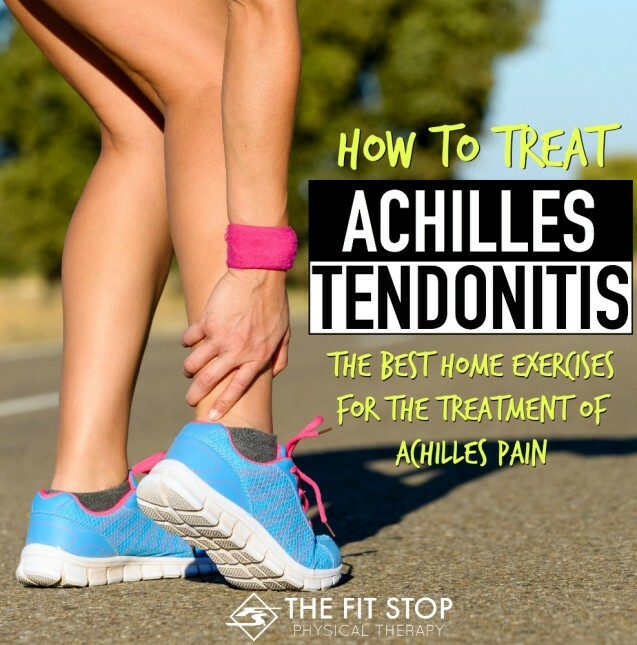 If the pain has been lingering for a week or more, it is likely that you have a slight tear in the tendon that is severe enough to warrant a little rest and rehab to heal. Just “playing” through the pain will most likely make the problem worse. Consider instead some “crosstraining”, meaning find an exercise (generally lower impact, such as biking, eliptical, water jogging to name a few), that doesn’t seem to make the pain worse. This way you can maintain some level of conditioning, without making the AT situation worse. Manual therapy – probably the more important part of the treatment. With tears in muscles or tendons, the muscle fibers initially begin to heal with scar tissue. Scar tissue is not as strong as normal muscle tissue and can be painful. Your physical therapist will focus hands on manual therapy throughout the painful tendon and neighboring affected tissues, to help break up scar tissue and normalize tissue quality. This can be somewhat painful at times, but a very important step to help break the pain cycle and to help eliminate weakness in the tissue. Therapeutic exercise – As the pain begins to subside, it will be important to begin a gradual progression of focused exercises to also help normalize the damaged tissue and to facilitate a return to activity. See my attached exercise program for AT for some examples of these kinds of exercises. This is a very individualized aspect of your treatment, so keep in mind that these are only very general examples. Everybody is different, and different exercises may be prescribed based on individual weaknesses throughout the foot, ankle and even hip and knee. Physical agents – At times, your therapist will use treatments like cold or heat therapy, ultrasound and electrical stimulation, to help control pain during the treatment process and also to help speed up healing by increasing blood flow..
As you start to feel better with treatment, the exercise component of healing is very important to long term healing. 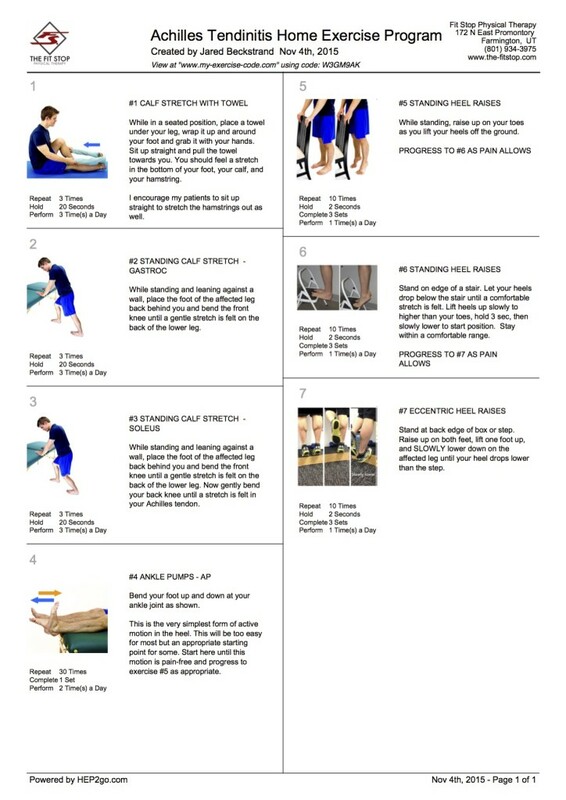 The overall strength of the tendon and the ability to completely heal from the damage will greatly be helped by the heel raise exercises outlined in this attached exercise program. If you are having problems and/or having significant pain when performing any of these exercises, please consult with your physical therapist. There are certainly modifications that can be made to this program, to help ensure that you healing progresses smoothly. If you’re experiencing pain in the tendon down towards the back of the heel, the following are exercises that we recommend to our patients who come to us with this issue. This home exercise program was generated using the website www.hep2go.com – they’re the best source we have found for home exercise program generation and are essential to the success of our clients. Click the picture to open the PDF in a new window! What is spinal stenosis and how can PT help?